Last week, a fringey radio talk show host with misogynistic tendencies attacked me on the air for speaking out against two-time Booker Prize winning author Hilary Mantel's horrific and cartoonish depiction of Anne Boleyn as a villainess with "black eyes and a cold slick brain." He further chastised me for daring to write a new version of the life of Anne Boleyn. Although my new Boleyn book has not been published and not even a single paragraph of the content of my years of research has been leaked, he asserted that I did not have the right to publish a positive account of the much maligned queen. This man, who once referred to himself as a progressive thinker, has turned his coat and is now attempting to make his name as the New Thought Police by reacting viciously to true progressive research. I was only one of several writers who were attacked on this unfortunate and narrow show. But attacking a book simply based on what one thinks may eventually be in it - and because it dares to challenge the academic paradigm - with no evidence whatsoever of its content is a new and all-time low. Instead of moving forward in our thinking in the 21st Century, many are actually taking huge steps backwards. There appears to be a reactionary backlash now, a fanatical need to keep new material from coming out. What is this man, and his reactionary ilk, so afraid of? Why is the idea of looking at history differently based on thorough investigative research considered a crime by such narrow minds? On the plus side, the side effect of such a show is that some of his listeners who were previously unfamiliar with my work have contacted me and are now keenly interested in the subject! I am receiving mail from those who are now anxious to read both of my forthcoming books on Anne Boleyn and Henry VIII to see what all of the fuss is about. Such is the nature of controversy - it gets people talking, and it gets the open minded THINKING. Perhaps I should send Mr Fringe a thank you note for sending me so many new readers! Below is an open letter I have written to address this issue of why it is so important to re-examine Anne Boleyn's story now, and why I will not be silenced by small minds and big egos on my path to find the true stories of women in history. The battle cry of the Celtic warrior, Queen Boudica, has been my personal motto for the two decades that I have been on this journey to reveal the greatest untold stories of history. It is emblazoned on over a million copies of my novels in over 40 languages all across the globe. My quest for the truth against the world - to uncover the hidden stories of the most maligned and misunderstood characters in history and bring them to life through the medium of historical fiction - turned into a twenty year adventure across four continents. Human history is a mosaic, a brilliant collage of glittering pieces, combining gems from art, archaeology, folklore and oral tradition with existing academia to present a new version of the characters and events we once thought we knew so well. When I wrote my first novel with Mary Magdalene as my protagonist, The Expected One, I never thought I would find a muse to equal that great lady. I did not believe there could ever be a character as romantic, as powerful, as courageous and as tragic as the great Magdalena. I certainly could not have dreamed then that Anne Boleyn would become the single greatest inspiration of my writing life. How could I? I knew what everyone knows about Anne: she was the second wife of Henry VIII, the one who lost her head because of her scandalous behavior. But as I embarked upon three intense years of research for my novel of the Medici family and the birth of the Renaissance, The Poet Prince, strange and unexpected ties pulled me into Tudor history - deeply. I didn’t set out to write about Anne Boleyn at all. And had I approached the subject from the point of view of every other historical novelist – using the work of Tudor historians solely as my base of information – I would have never considered it. There is nothing new to glean about Anne's character or contribution using traditional Tudor source material. I would have never discovered this powerful and magnificent personality, this “secret Anne” whom Henry VIII fell madly and hopelessly in love with, the Anne who inspired him to change the world. I resisted the growing desire to write about Anne Boleyn for a long time. There were already so many volumes, old and new, fiction and academic, devoted to her life and times. The Tudors series was a smash hit on television and there were literally a million websites devoted to Anne or some aspect of her life. A million. A USA Today article declared that the American fascination with Tudor history is “never going away” and further declared it to be “Tudormania” and “a media obsession.” The article compared Henry VIII and Anne Boleyn to Brad Pitt and Angelina Jolie! Clearly, the A-list supernova at the center of the Tudor galaxy was and is Anne Boleyn. Yet none of the existing books or websites, film or television portrayals, showed the Anne Boleyn that I was coming to know. None of them told the poignant, tragic tale of a great love gone terribly wrong or of a woman devoutly committed to creating a spiritual revolution in Europe. Anne would not leave me alone, and these elements of her story seized my imagination and spurred my research, sending me on an amazing journey across Europe to find the real woman behind the legend. What I found was stunning and completely unexpected. 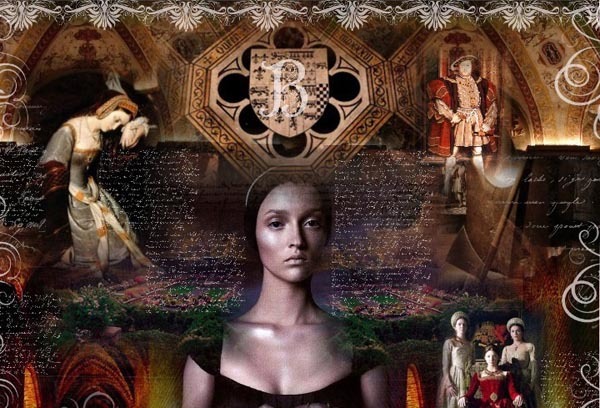 The connections between Anne Boleyn and the most powerful and influential families in Europe, including the Medici, Hapsburgs and Valois, were many – and enduring. Going back to the Boleyn biographies and major works of fiction, I was shocked to find that none of them looked at Anne’s early life or European connections in any depth, if they were even mentioned at all. Something was clearly wrong here. Anne Boleyn was raised in Belgium and France by the most fascinating, world-changing women in European history, and yet it is mentioned only in passing at best. Her education in humanism – and heresy – was profound and provable, yet it has been completely ignored in virtually all accounts of her life. Compounding the historical crime, some of the most colorful female characters in history have been omitted from virtually all Boleyn books, fiction and non. Anne Boleyn is the poster girl for the abused historical woman, the queen of the maligned and the misunderstood. The majority of what is used as research regarding her life comes from a singular prolific source who was paid to discredit her. She is historically recorded almost solely by her enemies, as her friends and defenders were unable to speak of her for fear of persecution – and promise of a gruesome death. No one I have encountered historically has been so terribly and deliberately decimated by history. But no one I have encountered has been as pioneering, fearless or passionate, either. As a heroine, Anne is the most complex romantic character I will ever know. She is a muse for the ages, and her story – her true story – is that of a queen who changed the world through the sheer power of her courageous personality, and the fierce nature of her love. Anne’s true story has been screaming to be heard, and I could not ignore it. I vowed to tell it and to stop at nothing until I had accomplished that goal. As part of my quest to defend Anne’s name and share the discoveries of my extraordinary research along this path, I acquired the web domain www.AnneBoleyn.com. I will support my forthcoming novel, The Boleyn Heresy, as well as a non-fiction book of research details, co-authored with my husband Philip Coppens, Avenging Anne Boleyn, with what I hope will become the ultimate and definitive website on Anne Boleyn’s life and accomplishments. The debut of this website will occur in the Spring of 2013. A true Renaissance Queen, it is time that Anne Boleyn is finally remembered as the unparalleled heroine that she was – in life, in love, and in death. The truth against the world! So has it always been, so shall it ever be. And I will die with that slogan on my lips, regardless of the opposition. Please visit the under-construction www.AnneBoleyn.com and sign up for the newsletter if you would like to be notified of new material and the official site launch, coming in 2013. *Thanks to Heidi Alonzo for the lovely collage of Anne Boleyn, above.